The hills are alive, with the sound of cheese whey being turned into biogas. 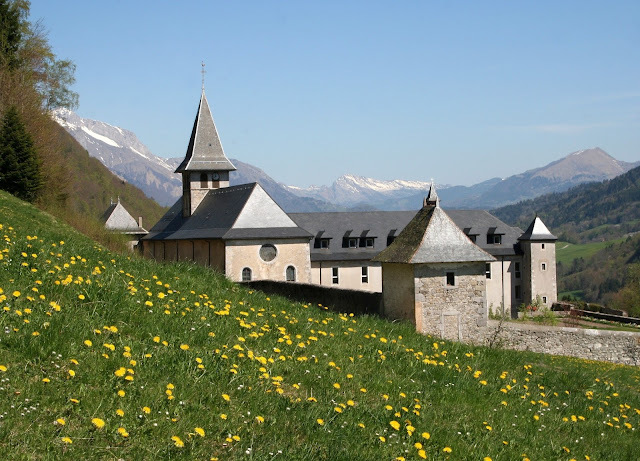 For example, the Abbaye de Tamié monastary in Savoie processes 4,000 liters of milk per day (around 1,000 gallons), making 400kg of cheese, with 4 cubic meters of whey and 8 of white water as byproducts. In 2003, the abbey built a methanization plant that takes the whey and white water and settles them in a tank to acidify them; then it goes through a process that includes something called an Upflow Anaerobic Sludge Blanket. And in the end, the plant produces a biogas with 60% methane for the abbey's boiler which can run between 15-17 hours per day and provide hot, clean water for 60-80 people. It's then re-oxygenated at the end, which makes it biodegradable, and deposited into the soil. It's been enough of a success that several other cheese dairies in the area have installed similar systems, running on their own cheeses, including one in Albertville. The power plant in Albertville runs on the byproducts from local Beaufort cheese. It produces about 2.8 million kilowatt-hours per year, enough to provide energy for about 1,500 people. The energy is sold to EDF, the French electricity utility and one of the biggest utility providers in the world. Meanwhile, in Paris, this is what the front entrance of our building looks like, as EDF and the city work to update the network in vast expanses of our neighborhood. It's a lot less picturesque than an Alpine cheese farm. 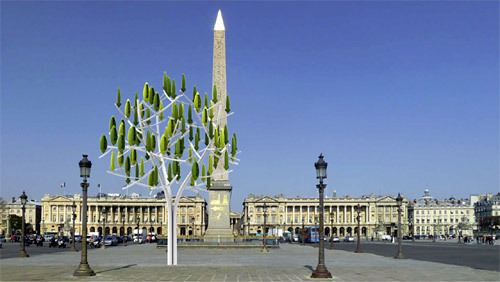 Here's a construction that was proposed, but I don't think it was ever actually installed: the Arbre à Vent (Wind Tree) was set for a trial run in spring 2015 in the Place de la Concorde. Supposedly, the tree, whose leaves are individual mini-wind turbines, is supposed to be capable of producing enough energy to house a family of four for 300 days of the year (this is France, so the assumption is probably that the family is on vacation the other 65 days...). And while we're on the topic of environmentally friendly energy production and usage, here on the expansive palace grounds of Chantilly (gardens that the famous LeNotre designed and called his favorite creation) just outside of Paris, the gardeners are saving energy and, at the same time, saving themselves a whole lot of mowing by having roving herds of sheep do the job instead. This one seems to have run out of gas. If your sheep's get up and go has got up and gone, you can always use goats instead. Here, the lawn mowers at the Jardin des Tuileries are silent (except for the occasional "meeeeh"), environmentally friendly, and very photogenic. 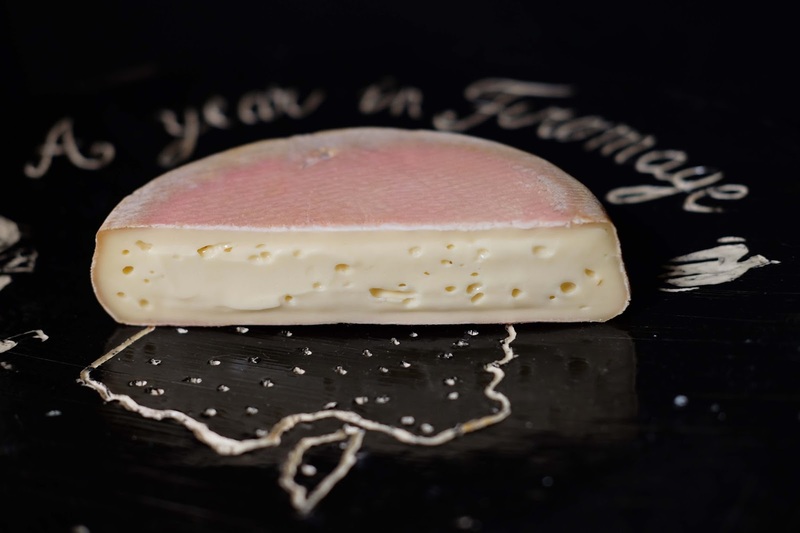 Abbaye de Tamié is a raw cows' milk cheese made at the Notre Dame de Tamié Abbey, what we would call a monastery in English, because it houses Cistercien-Trappiste monks. Located in the Bauges at just under 1km of altitude, near the Tamié hill in Savoie, these monks put out a high quality mountain cheese in a tradition they say dates from the year 1132 (which is a very precise start date for something nearly 900 years ago). Abbaye de Tamié is a semi-soft cheese that packs some power. Let's just say that when I had the cheese out of the refrigerator (but still not even warmed up fully) and was photographing it, in the back of the apartment by the window for the natural light, Anthony walked in the front door. His immediate reaction was to ask if there was a problem with the toilet, till he realized what he was smelling was my cheese (thus answering "who cut the cheese?" literally). This is not to say the cheese smells like crap: more like a tremendous output of cow methane. In all seriousness, Abbaye de Tamié is not the strongest-smelling cheese ever, but it is strong. And it does have distinct hints of both ammonia and earth (think wet leaves, or mud) in the aroma, so cow farts are just not so far off. The flavor has that same undercurrent of earthiness, with residual sweetness from the cream, and a great tangy stink. Stinky tang? Stang. The texture is lovely: silky and unctuous while still retaining a firm shape. I have wanted to write this story up for a while but needed to get a hold of some Abbaye de Tamié first, and that proved problematic. I called the abbey several times and got passed around to various people, all of whom told me it is sold in Paris but none of whom could tell me where. I recently had a working lunch (yes, there was cheese and wine involved -- rough life) with the good people from La Cremerie Royale, an online service specializing in rare cheeses. We were eating in the cave at the Coop (full name: Coopérative laitière du Beaufortain) near the Jardin de Luxembourg, and I told them how I had been searching in vain for this cheese. We walked upstairs after the meal and discovered it was sold right here in the store's display case. It smelled like cheese, but it felt like fate. If you can't get to the heart of Paris to buy yourself a full or half round, the abbey will also mail and deliver. Besides providing me personal energy through its yummy calories, Abbaye de Tamié also provides energy to the monastery where it's made through the innovative biogas recovery process. I'm not sure if you've enjoyed this posting, but I can say for sure that this cheese is a gas! I just love this post !